An estimated 600 million birds die from building collisions every year in the United States. The BirdCast team has published new research highlighting artificial light at night as a contributing factor. We ranked metropolitan areas where, due to a combination of light pollution and geography, birds are at the greatest risk of becoming attracted to and disoriented by lights and crashing into buildings. The research was published today in the journal Frontiers in Ecology and the Environment. It combines satellite data showing light pollution levels (see below) with weather radar measuring bird migration density. 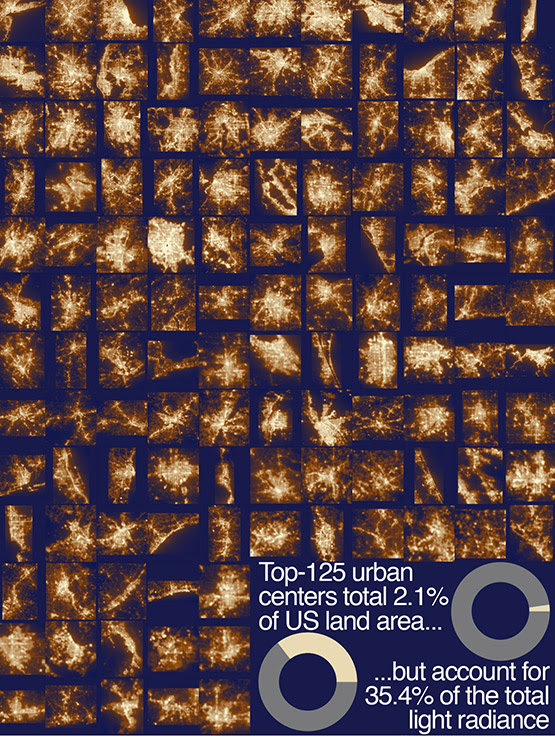 Satellite data depicting light pollution from the 125 most populous cities in the US. Graphic by Kyle Horton, Cornell Lab of Ornithology. Because many birds alter their migration routes between spring and fall, rankings of the most-dangerous cities (see below) change slightly with the season. During spring migration, billions of birds pass through the central United States between the Rockies and the Appalachians, so cities primarily in the middle of the country comprise the most-dangerous list for that season. Heavy spring migration along the West Coast also puts Los Angeles on the spring most-dangerous list. Fall bird migration tends to be intense along the heavily light-polluted Atlantic seaboard, which is why four eastern cities make the list in autumn. There is also a bottom line, conservation message from the research we published – turn off unnecessary lights! Reference: K. G. Horton, C. Nilsson, B. M. Van Doren, F. A. La Sorte, A. M. Dokter, A. Farnsworth. Bright lights in the big cities: migratory birds’ exposure to artificial light. Frontiers in Ecology and the Environment. 2019.